Hi, I'm Jamie I'm here to tell you about our standard PJN3 unit. This is the workhorse of the portable restroom industry. 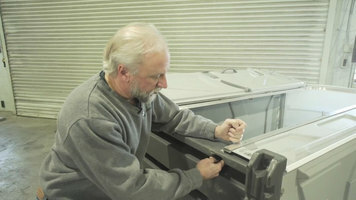 We've been manufacturing this unit in various states for 30 years, obviously we've made improvements through the years. We have a plastic door pull on the front, aluminum door frame for increased strength and rigidity. This front panel is also available in an all-plastic variety. We open up the door, you'll see the floor space on this unit is greatly increased from other units that you've seen. 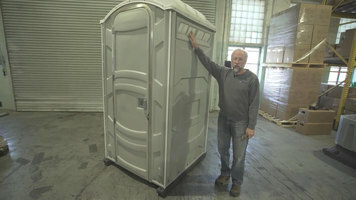 It has 17.5% more floor space than any other portable restroom in its class. We have a standard operating toilet paper dispenser, 2 rolls. Waste tank capacity is 60 gallons, this is a static tank, but this unit also comes with an optional recirculating flush and fresh flush option. We see to the left we have our urinal, that's standard equipment but also in that area you could add a sink if you wanted. We have a 4" ventilation duct which evacuates all those nasty odors and our screens which are angled in to minimize dirt from entering the unit. Now going forward to the door you'll see we have a slide latch here, convenience handle, mirror. Again this is all standard equipment. Spring assembly to hold the door closed, the dimensions of this unit are 43 1/2" wide, 47" deep, and 91" tall. Up here on the roof you'll see that we have notches that will center the straps to keep the straps from slipping off the roof during transportation. And bringing down to the end of the unit, the bottom here, we have holes in all four corners of the base so you can drive down stakes to stop the unit from tipping over in a high wind situation. Now if you'd like any more information on this product or any other products that we manufacture please visit our website and I thank you for watching. We're going to start assembling this PJN3 unit. We have our tools all laid out and ready to go. We have our impacts here. We have a 7/16" kind of deep socket, then we have a deep socket 7/16", a hammer, vice grips, a drill with a 13/64" drill bit, a Phillips screwdriver, slotted screwdriver and a pneumatic rivet gun. A regular rivet gun could be used if you didn't have air power; same thing with impact wrenches if you just had a ratchet and a wrench you could do it that way as well. We also have all of our parts, small parts laid out as well. We have a side latch, door pull, spring retainer, door handle, a spring, and then other various parts; door kit cable, mirror, we'll go through those parts as we assemble. Everything is ready to go and laid out, let's start assembling. When you order your PJN3 unit, if you get it sent assembled you will get all these small parts shipped to you in a parts bag. So you will have all these parts available for you. We're going to get started with our assembly. We have our front assembly here and we have our base leaning up against this table. If you didn't have a table like this in your shop or anything of this height that you could support your front assembly on when you lay it down you could use a tank standing on end to support your front assembly. Expose the two holes on the side of the jamb, line up the holes of the jamb with the slots in the base and you have measure the opening. A good idea would be to put the bolts in all four holes and get your nuts and your washers to hold that down but not tight. Get your door centered and your opening, and then tighten everything down. We're taking the PC-000122 bolts with a PC-000123 washer and a PC-000140 lock-nut and we're going to put the washer on the back side of that bolt and then run our nut up. These have a nylon insert in them to prevent them from loosening up and backing off. We're going to now tighten everything down. What we'll do is we've got our 7/16" impact with our socket with our impact wrench, and a Phillips screwdriver. We'll tighten up this side first and then we'll check our gap between our door and the jamb, making sure that's consistent all the way down and then we'll tighten up this bolt. After we get done with those we'll tighten up the top ones. Making sure the gap is consistent we'll open up the door. Using that same 7/16" impact we can now install the lag screws in the front. When tightening these up it's important not to over tighten them. Just go until they get snug, otherwise you'll strip out the plastic. Now we're going to stand the unit up on the base. We can start assembling the door part. We're going to assemble our door handle and our slide latch now. That's done by hooking the front edge, the leading edge, of the door pull into the slot and popping it in. Then insert your slide latch. To guide it on the back side you take a screwdriver, push it back so that the leading edge of the slide latch will go and ride up on the front edge of that screwdriver and it pops into place. Now we insert the spring assembly into the hole of the door. Then taking the spring retainer you take the two tabs and insert those into the two holes and hinge it down into position. That will be held in place with two PC-000105 rivets. After that is installed you slip the spring up into there guiding the cable through the hole. Now we're going to assemble the grab handle on the inside of the door using the top hole of the door pull and a PC-000105 rivet we will fasten that in place in the bottom hole of the other side of the handle. We're going to install the door check cable that'll be held in place with 2 PC-000102 rivets. He's placing backup washers on the heads of the rivets prior to installing the rivets on the door check cable. Position the bracket as shown and rivet in place. Now we're going to install the mirror. Mark peeled back the covering over the mirror and then he's inserting the plastic snap fasteners into the holes of the mirror and into the door to hold it in place. Now we're going to install the end of the cable of the spring into the cable clip on the backside of the door jamb. What mark is doing is using the claw of the hammer as leverage to pull the cable out. Once he gets the cable pulled out he will then clamp a vice grip on the cable, holding it in position. Close the door and insert the end of the cable into the slot, open the door back up and then release the vice grips. Now we're going to assemble the door check cable to the top of the jamb using a PC-000104 rivet and then a PC-000168 washer and PC-000106 washer on the backside. The rivet goes through the jamb, put the looped end of the cable on the rivet, put the large 168 washer and 106 washer and fasten it in place. We're going to start assembling the toilet seat. All the parts come with it as you see. We're going to leave the plastic on the lid for safety reasons to prevent it from getting scratched up. Tear your plastic away, put your lid with your seat, insert the post and then insert a snap into the hole and snap into place when it's flush with the outside. Attach the seat to the tank; a very straightforward process. Put the studs to the tank and then tighten it up on the other side. Using the same table that we used to assemble the front to the base, we're placing the 3 side panels on that. Again, if you didn't have a table like this to assemble your 3 sides together, you could use 2 tanks on end in the center to support that one side panel. We're going to rivet the side panels together with the corner extrusion using PC-000100 rivets with PC-000106 backup washers. When riveting the sides together it's important to rivet from the front side of the unit which is facing down now with the backup washers towards the rear. Locate your center hole, insert your corner extrusion onto the side, lining up the holes, slip the edge of the side into the corner extrusion lining up the holes again and rivet in place. Repeat the process for the other side, lining up the center hole with the corner extrusion and then slipping the edge of the corner extrusion over the side panel. Stand the 3 sides up and then wrap those 3 sides around the base of the unit. Then we'll repeat the process that we just did with the 2 rear corners with the front corners using the same rivets and washers. Now we're going to fasten the sides to the base with the PC-000192 lag screws, but before we do so we have to shim up the back corners with a couple 1/4" shims. Making sure the side panel is centered on the base, drive a lag screw through the center, again making sure not to over tighten and strip out the screws in the plastic. Then working from the back to the front finish driving in your lags. Repeat this for the other side. Now using a drill with a 13/64" drill bit, drill through the dimples that are marked in the roof while pulling the roof down into position and into your front assembly. Working your way around the unit, making sure to pull the roof down, drill all your holes. This is our plastic variety, it's a PJP3 front of panel that goes on our standard PJN3 unit. The semi-process that you just watched is the same except when you fasten the roof to the front panel you would drill only through the outside layer of plastic on the front panel and you would install the roof to the front using 105 rivets and 106 backup washers behind the head of the rivet before it's installed. Pull the tank completely tight against the floor plate on the front and then while holding the tank in position, drill the side holes and rivet the tank into place. Mark was drilling the holes and rounding out the holes a little bit to give a little extra clearance for the rivets. The screens can be slipped into position at this time making sure the wider end of the screen is facing the center of the side panel, and that the ribs on the inside of the screen are facing the inside of the unit. Making sure the screens are completely centered on the side, drill through the center hole of the two screens; insert rivet there temporarily, and then drill the other two holes. Locate your TP dispenser where you'd like to have it placed in your unit. That is simply a matter of preference for you. Using a black marker after it's level and in position, mark the 4 holes on the underside of the dispenser onto the side panel. Drill the 4 holes out using a 13/64" drill bit. We're going to rivet the tank into position using PC-000103 rivets with 106 backup washers on the inside of the tank. Now rivet your roof into position using the PC-000100 rivets with backup washers on the inside of the unit. Rivet your screens into position using those same rivets and washers. You can see Tom and Mark have developed a nice system of knowing when to rivet by Tom knocking on the side panel letting Mark know when to rivet. Now you can install your TP dispenser at this time using those same rivets. We're going to slip our vent stack up into the roof and then down into the recess of the tank. Then using a drill with a 13/64" drill bit, drill through the recess of the tank and into the vent stack. Now Tom is riveting into place using a PC-000117 rivet. The urinal came shipped inside of your tank. Simply place the spout of the urinal into the hole that is already drilled on the top of the tank, level the urinal out on the side panel and then using a 13/64" drill bit, drill through the urinal and into your side panel. Rivet from the inside out of the urinal with backup washers placed on the outside of the unit by the rivets that were used to hold the urinal in place. We're going to wrap up the assembly of this unit by installing a TP rod and lock, then assembly is complete. That wraps up our assembly of the PJN3 unit. Thanks for watching. Thanks for Tom and Mark for helping us out put this together, and thanks for buying our products. Have a great day. Hi, I'm Jamie, I'm here with the PJN3 unit and I'm going to show you how to replace the screens in your side panels. What we are going to need to do this is a drill with a 13/64" drill bit, a vice grips, and then a rivet gun to reinstall the rivets with a person to help with this process. So I will start by going on the inside and taking my vice grips and clamping on to the inside of the rivet. Now the reason I am doing this is when I drill the rivets out from the outside of the unit the rivet could possible just spin and spin so in order to keep that from happening what I'll do is take the vice grips and clamp that on to the rivet and then I will go on the outside and drill this out. Now taking my drill with my 13/64" drill bit. Place your drill on the center of the rivet and go ahead and drill that rivet out. Now you hear the vice grips fall to the ground and we will repeat this process for the other 2 rivets. Now as your heard that vice grip falling, it is best to have a person on the inside helping you with this by holding that vice grips. You are also going to need a second person to help with the re-installation by holding the back-up washers. We are going to start by taking these screen out now that we got the rivets drilled out. Now if you are replacing just the one screen you only have to drill out the two rivets that are holding that screen in. To show we are going to pull both screens out. For re-installation you can see there is a wider part and a narrower part of the screen. We are going to take the wider part and place that toward the center of the side panels. And these just slide in as so. It's a little tight fit but not too bad which is good. And we will line up our center hold like this by overlapping the two screens and now we will reinstall the rivets. Now we are going to reinstall the screens using three PC000100 rivets and 3 PC000106 washers. Have somebody on the inside holding the washers while we rivet from the outside. Now I'm using a pneumatic tool but this can be used with a hand-rivet tool as well. Just rivet from the outside going in and the person on the inside will push the screens over the rivet, place the back up washer. And simply rivet in place and we will do the same thing for the other two rivets. And that does it! So if you'd like any more information about other products that we like to repair or other products in our product line please visit our website and thanks for watching. Hi, I'm Jamie and I am here to show you how to replace the spring assembly on your PJN3 unit. So if we open up the unit we will see inside we have our PC000800 spring assembly. Now the internal components of the spring assembly are not really replaceable, it is advisable to replace just the whole assembly it makes it so much easier. So where we start is basically by taking the spring assembly out of the unit, just simply push it back into the door like this, feel the retainer clip, and then pull this old spring out. Now we have our replacement spring assembly PC000800 and we are going to like we took out do the same thing we are going to put it into the door first and then we are going to push the cable through and the key is to guide the cable through the hole, taking a hammer with the claw on it and a vice grips we are going to grab the end of the cable and pry it against the door jam like that I'm holding the door with my foot and then clamp down on the cable like so, then we close the door slightly we will be able to guide the cable into that clip and you can see it releases the tension on the vice grips, release it and you are in business. Now if you need any more information about how to replace our spring or any other parts on out PJN3 unit feel free to visit our website and thank you for watching. Make sure the door on your PolyJohn unit remains working like new with a new spring assembly. In just a few simple steps you can have the spring assembly on your door replaced and ready for use! 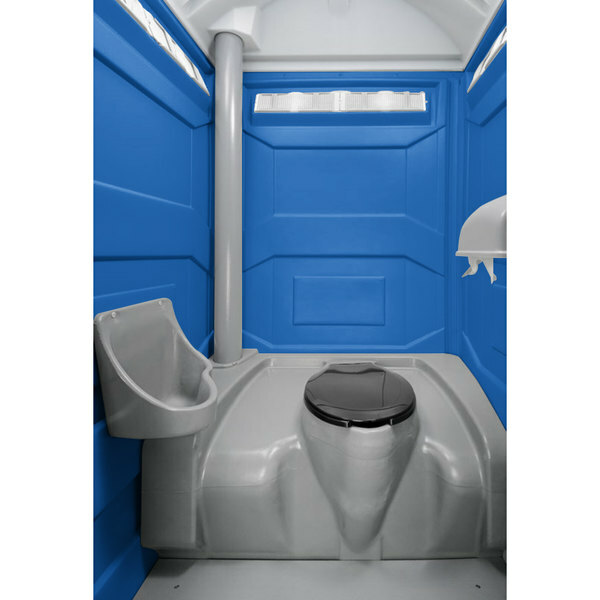 How many portable restrooms and sinks do I need for my commercial job site or event? Every job site and outdoor event is different. The duration and number of attendees are the biggest factors determining how many portable restrooms and sinks are necessary. For commercial work sites, it is recommended to have 1 portable restroom for every 10 workers. For other outdoor events, see the downloadable Restroom and Sink Estimator in Resources and Downloads. Is it normal that there are slight variations in color of this portable restroom roof? This is quite normal and not a sign of poor quality control. Due to how the various materials are manufactured from PolyJohn's suppliers, there may be some slight variations in the tint. These variations will bleach out over time. How quickly they disappear will depend on the amount of sunlight and weathering the unit receives. Does this portable restroom come fully assembled? 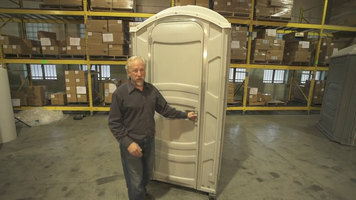 Yes, this portable restroom comes fully assembled unless otherwise stated on the purchase order. 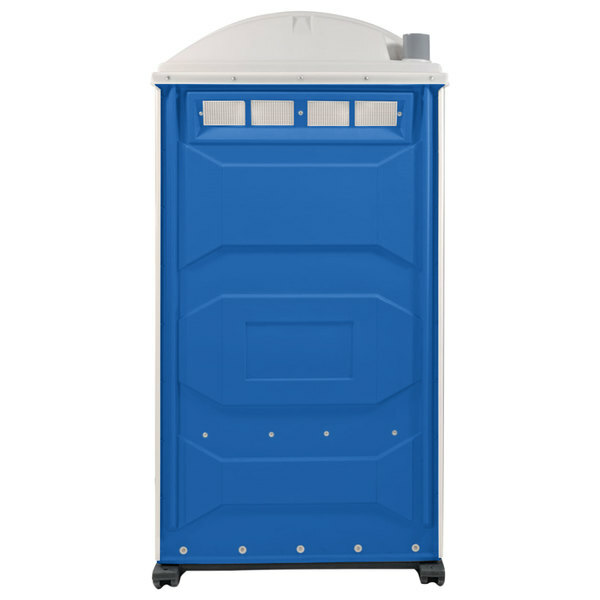 Known as the workhorse of the industry, this PolyJohn PJN3-1001 blue portable restroom is a highly popular and praised portable restroom. With its lightweight, compact, and sturdy design, this portable restroom is the perfect choice for concerts, fairs, or any other outdoor event. The tough construction inside and out is ideal for commercial worksites too. You can also install a dump valve on this unit, giving you the option to connect toilet waste to a holding tank. 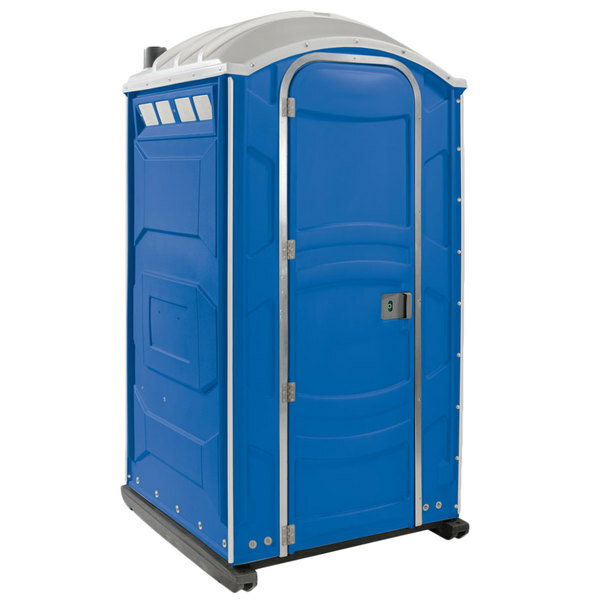 Inside this portable restroom is a comfortable and roomy interior that is easy to keep clean and sanitary. This interior is over 17% larger than other comparable portable restrooms too. This additional space makes the portable restroom more comfortable to use as well as providing ample room to use the non-splash urinal that comes standard in each unit. 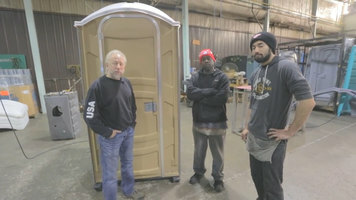 This portable restroom even has a translucent roof for better natural lighting inside the unit. Its anti-slip floors help minimize the risk of slips and falls too. Additionally, each portable restroom includes two tissue roll holders with toilet paper, a door mounted mirror, and door handle. On the door, there is an occupancy signal latch that lets you know if the unit is currently in use. The door and door jam are made from heat treated aluminum that is specifically designed to withstand frontal impact. 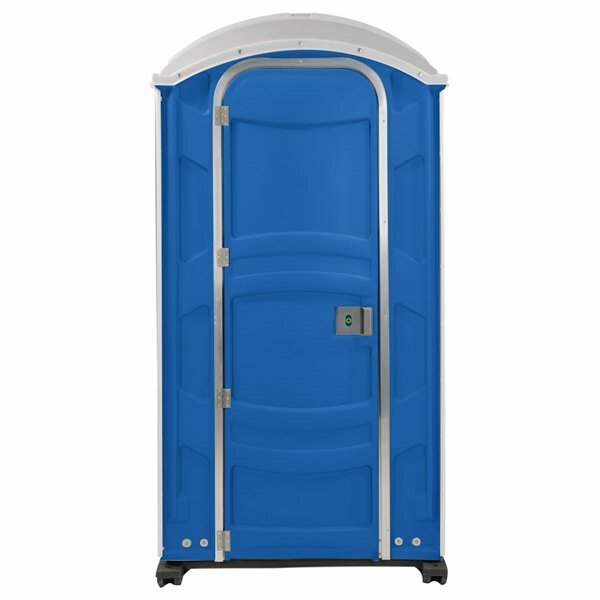 Featuring an attractive blue color, this portable restroom adds a splash of color to outdoor events as well. Each portable restroom includes a ventilation pipe to keep odors and unpleasant smells minimized inside the portable restroom. Most importantly, this PolyJohn portable restroom is easy to service and clean too. Thanks to its advanced waste tank design, this portable restroom is able to have a deep central sump to make cleanout fast and thorough. This portable restroom even has a place for decals so you can label them with your business's logo. 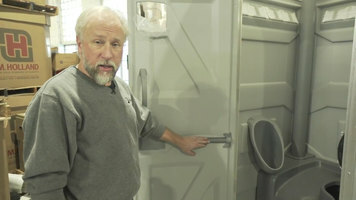 PolyJohn sets the standard for the sanitation industry and is the leading manufacturer of portable restrooms. Their products are made for high traffic areas such as commercial worksites, festivals, and fairs. Most importantly, each PolyJohn is designed to be easy to clean and maintain. Regardless of where you need them, PolyJohn's products are built to withstand years of use. This item comes fully assembled.